Potassium is an important mineral required by our human body to perform its various tasks. It also performs the role of an electrolycte. 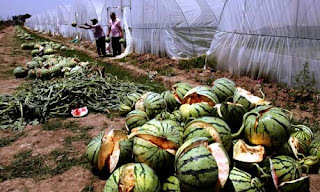 Read more below, an article which was extracted from the web page of http://www.organicfacts.net. The health benefits of potassium include stroke, blood pressure, anxiety and stress, muscular strength, metabolism, heart and kidney disorders, water balance, electrolytic functions, nervous system and other general health benefits of potassium. Potassium, the third most abundant mineral in human body, is the synonym for health insurer. It contains the qualities for maintaining a high level of human well-being and a cheerful lifestyle. There is no way one should overlook the inclusion of potassium in routine diet plan. Apart from acting as an electrolyte, this mineral is required for keeping heart, brain, kidney, muscle tissues and other important organs of human body in good condition. Potassium chloride is the main variety of this mineral amongst others. It works in association with sodium to perform a number of critical body tasks. Deficiency Symptoms : Deficiency of any nutrient in the body is not desirable and potassium is not an extension in this case. A diet deficient in potassium may lead to symptoms like fatigue and weakness in muscles. Other indications for deficiency of potassium include inactive reflexes, abnormal heartbeat, heart palpitations, anemia and severe headaches. The person may also experience high blood pressure, pain in intestine, swelling in glands and diabetes as serious effects of this deficiency. Important Sources : A balanced diet must contain fair quantity of potassium, as per the recommendations of the health experts. In order to list most important dietary sources of potassium, one may begin with citrus fruits, vegetables and grains. Also, salmon, chicken, whole milk, fresh fruit juices and almonds are considered as rich sources of potassium. Apart from these, nuts, lime beans, potatoes and poultry are other products to be include dint he list. However, the most important source of potassium is bananas. Stroke : Potassium plays an important role in keeping the working of brain in normal state. It is of great importance in preventing the occurrence of stroke in human brain. It is a fact that a person suffering from this dreadful disease may be found deficient in this essential body nutrient. Low blood sugar : Decrease in potassium level causes a drop in blood sugar level. Decrease in blood sugar level causes sweating, headache, weakness, trembling and nervousness. Intake of potassium chloride and sodium provides immediate relief from such situation. Muscle disorders : Potassium plays an important role in regular muscle contraction. Right concentration of potassium, is required for the regular contraction and relaxation of the muscle. Most of the potassium ions of the human body are present inside the muscle cells. It maintains muscle function and optimal nerve. Cramps : Muscle cramps result due to low level of potassium in the blood, a condition called as hypokalemia. Intake of a banana everyday prevents muscle cramp. Bananas are rich in potassium content. Brain function : Potassium channels play a key role in maintaining the electrical conductivity of brain and affect the brain function. It is also involved in higher brain function like memory and learning. In addition to it, serious ailments like epilepsy are related to the functioning of potassium channels. Blood Pressure : Potassium is helpful in reversing the role of sodium in unbalancing the normal blood pressure. Thus, it acts as a vital component, which maintains the normality of blood pressure in human body. This further abolishes the possibilities of heart diseases and hypertension. Regulation of blood pressure is an important function of this mineral. Anxiety and Stress : Potassium is of great importance for people suffering from undesirable mental states like anxiety and stress. It is considered as a perfect stress buster and thus it ensures efficient mental performance of human body. Muscular Strength : This is in fact, one of the most appreciable benefits of potassium, as it ensures proper growth of muscle tissues and proper utilization of energy released during metabolism to add significant worth to muscular strength. The muscles, together with cardiac muscle, are prone to paralysis due to deficiency of potassium in diet. Metabolism : It assists in metabolic process of various nutrients like fats, proteins and carbohydrates. Thus, potassium is of great value in extracting the energy out of nutrients consumed by man. Heart and Kidney Disorders : The health benefits of potassium ensure good health for heart as well as kidneys. It plays an irreplaceable role in regulating the functions of potassium. Apart from this, this mineral assists kidneys to remove waste by the process of excretion. However, it is strictly advisable to consult your doctor to get recommendations about dosage. Water Balance : Potassium has another significant role to play in maintaining the desirable water balance in human body. There are different types of cells, which require having proper water balance for proper functioning and potassium aids these cells in regulating this balance. Electrolyte : Potassium plays the significant role as an electrolyte in human body. It helps in regulating the level of fluids in human body and thus performs a number of critical body functions. Nervous System : Potassium helps in boosting the spirit of nerve reflexes to transmit message from one body part to another. This in turn helps in muscle contraction to perform various activities every day. Goji berries are typically found in China and Europe and in traditional Chinese medicine, they have been used in many medicinal preparations for thousands of years, proving its efficacy as a medicinal herb/plant. These longish red berries also go by the name Wolfberry, desert thorn and matrimony vine while the Chinese name is gou qi zi. These berries are often dried and eaten like raisins. 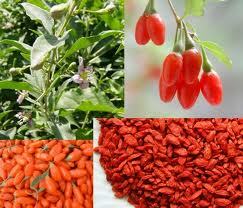 Goji berries grow well in harsh weather and can even survive the desert environment. These deep red berries are chockfull of nutrients and have a huge number of benefits. Goji juice has gained a lot of popularity in recent times as people in the West are waking up to the fantastic benefits offered by this plant. The good thing about Goji berries is that it can be consumed directly or incorporated into recipes and used as food. The benefits offered by Goji berries are numerous and a few studies have been conducted on human patients as part of research to determine the efficacy of these berries. However, here are some of the amazing benefits offered by the goji berries and going by the look of them, it’s no wonder they’ve become so popular on the health front. 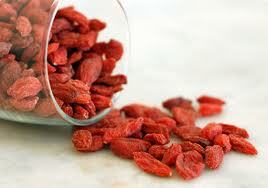 As we all know, goji berries are rich in antioxidants, particularly carotenoids such as beta carotene and zeaxanthin. These carotenoids are greatly helpful in protecting the retina of the eye and improving eye sight. In fact, foods rich in zeaxanthin have been known to prevent loss of eyesight in people over the age of 65. Goji berries are also a good choice when it comes to protecting the liver and kidneys. One of the primary benefits of goji berries is that they help in boosting the immune system and help us stay healthy for longer. The polysaccharides in goji berries works wonders with the pituitary gland and stimulates it to release HGH, the Human Growth Hormone. This is in fact the main hormone which controls others and can even reverse the effects of aging, making us look and feel younger. Goji berries also have a high ORAC value which is extremely important in preventing oxidation and in preserving the cells thereby preventing aging. Goji berries prevent fatigue and tiredness which are the most common by product of a busy and full life that most of us lead today. It also helps in relieving headaches and insomnia. Health and fitness freaks consume goji berries regularly because they help greatly in weight loss and keep the body fit and young. Research has shown that goji berries are exceedingly good to enhance fertility and improve sexual function, particularly in men. Goji berries are known to improve circulation and help people live longer lives. With their high vitamin and mineral content, goji berries reduce blood pressure and cholesterol. Some people claim that goji berries can even prevent cancer although this aspect still needs more verification. Goji berries are known to be mostly safe but the usual precautions prevail. In addition, goji berries could possibly interact with anticoagulant drugs or blood thinners such as warfarin and it could lead to some adverse effects. The ways in which goji berries can be consumed are several. Since it is pretty much like raisins, it can be munched as a snack directly or from a trail mix that is available at most health stores. Many people are making goji berries a part of their lifestyle by incorporating it into their breakfast by using it as a topping for cereal instead of raisins. Some people also swear by goji juice and how beneficial it is. Health stores are full of variants of goji juice available in bottles and people can consume them as juice. Some people also brew goji berry tea and drink it as it provides the same amount of benefits. In traditional Chinese medicine, goji berries can be added to soups or its liquid extracts are often provided to the patient. 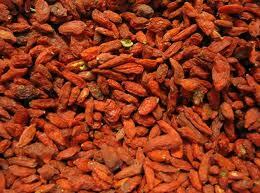 There are numerous other goji berry products available in health stores, such as goji berry powder etc. Most people use these to add to their milkshakes or smoothies for the extra zing and the burst of health it offers. The people of Tibet and Mongolia hold a two-week annual festival in honor of the goji berry. Many of them have nicknamed the goji berry “happy berry” because in common folklore “to eat goji in the morning will lead to smiles all day”. The goji berry has been used for hundreds of years as a tonic in Chinese medicine. During the Tang dynasty (A.D. 772-842), poet Liu Yuxi wrote a poem celebrating the nourishment of “body and spirit” brought about by the goji berry. Without a doubt, the people of this region of the world love the goji berry. But the goji berry’s introduction to the Western world is still fairly recent, so the berry remains a relatively unknown fruit for a large fraction of the world’s population. So what is a Goji berry ? And why is it so loved ? 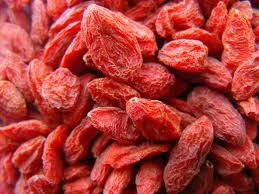 Goji berries grow on small green-leafed vines that yield a bright red fruit with a shape most resembling a raisin. The berries are extremely delicate, and during harvest, they are shaken from the vine rather than being picked. To avoid spoiling, they are slowly dried in the shade. The texture of a goji berry is very chewy, and its taste is often described as a cross between a raisin and a cranberry. What makes the goji berry so potent ? Goji berries are believed to be a rich source of vitamins and nutrients with each goji berry purported to contain 18 different amino acids and vitamins B1, B2, B6, C, and E. It is believed that goji berries contain more beta carotene than is found in carrots of equal size. And the goji berry is touted as one of the richest sources of vitamin C in the world, trailing only the Australian billygoat plum and the South American camu camu. Goji berries are also believed to contain zinc, iron, calcium, phosphorus, selenium, and germanium in varying quantities. As a rich source of many of the vitamins and minerals essential to nutrition, goji berries are filled with antioxidants. Potassium is a very important mineral for the proper function of all cells, tissues, and organs in the human body. It is also an electrolyte, a substance that conducts electricity in the body, along with sodium, chloride, calcium, and magnesium. Potassium is crucial to heart function and plays a key role in skeletal and smooth muscle contraction, making it important for normal digestive and muscular function, too. Many foods contain potassium, including all meats, some types of fish (such as salmon, cod, and flounder), and many fruits, vegetables, and legumes. Dairy products are also good sources of potassium. Having too much potassium in the blood is called hyperkalemia; having too little is known as hypokalemia. Keeping the right potassium balance in the body depends on the amount of sodium and magnesium in the blood. Too much sodium -- common in Western diets that use a lot of salt -- may increase the need for potassium. Diarrhea, vomiting, excessive sweating, malnutrition, malabsorption syndromes (such as Crohn's disease) can also cause potassium deficiency, as well as use of a kind of heart medicine called loop diuretics. Most people get all of the potassium they need from a healthy diet rich in vegetables and fruits. Older people have a greater risk of hyperkalemia because our kidneys are less efficient at eliminating potassium as we age. Older people should be careful when taking medication that may affect potassium levels, such as nonsteroidal anti-inflammatory drugs (NSAIDs) and ACE inhibitors (see section on Interactions). Whatever your age, talk to your doctor before taking potassium supplements. At least one study shows a positive link between a diet rich in potassium and bone health. More research is needed to determine whether a diet high in potassium can reduce bone turnover in people. The most important use of potassium is to treat the symptoms of hypokalemia (low potassium), which include weakness, lack of energy, muscle cramps, stomach disturbances, an irregular heartbeat, and an abnormal EKG (electrocardiogram, a test that measures heart function). Hypokalemia is usually caused by the body losing too much potassium in the urine or intestines; it's rarely caused by a lack of potassium in the diet. Hypokalemia can be life-threatening and should always be treated by a doctor. Some studies have linked low levels of potassium in the diet with high blood pressure. And there is some evidence that potassium supplements might cause a slight drop in blood pressure. But not all studies agree -- two large studies found no effect on blood pressure. It may be that taking potassium only helps lower blood pressure if you're not getting enough of this mineral to start with. Before taking potassium or any supplement for high blood pressure, talk to your doctor. People who get a lot of potassium in their diet have a lower risk of stroke. However, potassium supplements don't seem to have the same benefit. People with IBD (ulcerative colitis or Crohn's disease) often have trouble absorbing nutrients from their intestine, and may have low levels of potassium and other important nutrients. If you have IBD, your doctor may check your potassium levels and recommend a supplement. Good sources of potassium include bananas, citrus juices (such as orange juice), avocados, cantaloupes, tomatoes, potatoes, lima beans, flounder, salmon, cod, chicken, and other meats. Several potassium supplements are on the market, including potassium acetate, potassium bicarbonate, potassium citrate, potassium chloride, and potassium gluconate. It is available in tablets, capsules, effervescent tablets, powders, and liquids. Potassium can also be found in multivitamins. Potassium supplements, other than the small amount included in a multivitamin, should be taken only under your doctor's supervision. Do not give potassium supplements to a child unless your doctor tells you to. Older adults should talk to their doctor before taking potassium supplements. Side effects can include diarrhea, stomach irritation, and nausea. At higher doses, muscle weakness, slowed heart rate, and abnormal heart rhythm may occur. Contact your health care provider if you develop severe stomach pain, irregular heartbeat, chest pain, or other symptoms. People with hyperkalemia or kidney disease should not take potassium supplements. People who take ACE inhibitors, potassium-sparing diuretics, or the antibiotic trimethoprim and sulfamethoxazole (Bactrim, Septra) should not take potassium. If you are being treated with any of the following medications, you should not use potassium without first talking to your health care provider. Nonsteroidal anti-inflammatory drugs (NSAIDs): People who have poor kidney function and take NSAIDs are at higher risk. If you are taking any of these medications, it is important for your doctor to test your potassium levels to see whether or not you need a supplement. Do not start taking a supplement on your own. Digoxin - Low blood levels of potassium increase the likelihood of toxic effects from digoxin, a medication used to treat abnormal heart rhythms and heart failure. Your doctor will test your potassium levels to make sure they stay normal. What causes Muscle Cramp ? A muscle cramp is an involuntarily and forcibly contracted muscle that does not relax. When we use the muscles that can be controlled voluntarily, such as those of our arms and legs, they alternately contract and relax as we move our limbs. Muscles that support our head, neck, and trunk contract similarly in a synchronized fashion to maintain our posture. A muscle (or even a few fibers of a muscle) that involuntarily (without consciously willing it) contracts is in a "spasm." If the spasm is forceful and sustained, it becomes a cramp. Muscle cramps cause a visible or palpable hardening of the involved muscle. Muscle cramps can last anywhere from a few seconds to a quarter of an hour or occasionally longer. It is not uncommon for a cramp to recur multiple times until it finally goes away. The cramp may involve a part of a muscle, the entire muscle, or several muscles that usually act together, such as those that flex adjacent fingers. Some cramps involve the simultaneous contraction of muscles that ordinarily move body parts in opposite directions. Cramps are extremely common. Almost everyone (one estimate is about 95%) experiences a cramp at some time in their life. Cramps are common in adults and become increasingly frequent with aging. However, children also experience cramps. What are the types and causes of muscle cramps ? Injury : Persistent muscle spasm may occur as a protective mechanism following an injury, such as a broken bone. In this instance, the spasm tends to minimize movement and stabilize the area of injury. Injury of the muscle alone may cause the muscle to spasm. Vigorous activity : True cramps are commonly associated with the vigorous use of muscles and muscle fatigue (in sports or with unaccustomed activities). Such cramps may come during the activity or later, sometimes many hours later. Likewise, muscle fatigue from sitting or lying for an extended period in an awkward position or any repetitive use can cause cramps. Older adults are at risk for cramps when performing vigorous or strenuous physical activities. Rest cramps : Cramps at rest are very common, especially in older adults, but may be experienced at any age, including childhood. Rest cramps often occur during the night. While not life-threatening, night cramps (commonly known as nocturnal cramps) can be painful, disruptive of sleep, and they can recur frequently (that is, many times a night, and/or many nights each week). The actual cause of night cramps is unknown. Sometimes, such cramps are initiated by making a movement that shortens the muscle. An example is pointing the toe down while lying in bed, which shortens the calf muscle, a common site of cramps. Dehydration : Sports and other vigorous activities can cause excessive fluid loss from perspiration. This kind of dehydration increases the likelihood of true cramps. These cramps are more likely to occur in warm weather and can be an early sign of heat stroke. Chronic volume depletion of body fluids from diuretics (medicine that promote urination) and poor fluid intake may act similarly to predispose to cramps, especially in older people. Sodium depletion has also been associated with cramps. Loss of sodium, the most abundant chemical constituent of body fluids outside the cell, is usually a function of dehydration. Body fluid shifts : True cramps also may be experienced in other conditions that feature an unusual distribution of body fluids. An example is cirrhosis of the liver, which leads to the accumulation of fluid in the abdominal cavity (ascites). Similarly, cramps are a relatively frequent complication of the rapid body fluid changes that occur during dialysis for kidney failure. Low blood calcium, magnesium : Low blood levels of either calcium or magnesium directly increase the excitability of both the nerve endings and the muscles they stimulate. This may be a predisposing factor for the spontaneous true cramps experienced by many older adults, as well as for those that are commonly noted during pregnancy. Low levels of calcium and magnesium are common in pregnant women unless these minerals are supplemented in the diet. Cramps are seen in any circumstance that decreases the availability of calcium or magnesium in body fluids, such as taking diuretics, hyperventilation (overbreathing), excessive vomiting, inadequate calcium and/or magnesium in the diet, inadequate calcium absorption due to vitamin D deficiency, poor function of the parathyroid glands (tiny glands in the neck that regulate calcium balance), and other conditions. Low potassium : Low potassium levels occasionally cause muscle cramps, although it is more common for low potassium to be associated with muscle weakness. Contractures result when the muscles are unable to relax for an even more extended period than a common muscle cramp. The constant spasms are caused by a depletion of adenosine triphosphate (ATP), an energy chemical within the cell. This prevents muscle fiber relaxation. The nerves are inactive in this form of muscle spasm. Contractures can result from inherited (for example, McArdle's disease, which is a defect of the breakdown of glycogen to sugar within the muscle cell) or from acquired conditions (for example, hyperthyroid myopathy, which is a muscle disease that is associated with an overactive thyroid). Cramps of this category are uncommon. Can poor circulation cause muscle cramps ? Poor circulation to the legs, which results in inadequate oxygen to the muscle tissue, can cause severe pain in the muscle (sometimes known as claudication pain or intermittent claudication) that occurs with walking or exercise. This commonly occurs in the calf muscles. While the pain feels virtually identical to that of a severely cramped muscle, the pain does not seem to be a result of the actual muscle cramping. This pain may be due to accumulation of lactic acid and other chemicals in the muscle tissues. It's important to see your doctor if you have pain like this. What are the symptoms of common muscle cramps ? How are they diagnosed ? What is the treatment of skeletal muscle cramps ? How can muscle cramps be prevented ? Activity : Authorities recommend stretching before and after exercise or sports, along with an adequate warm-up and cooldown, to prevent cramps that are caused by vigorous physical activity. Good hydration before, during, and after the activity is important, especially if the duration exceeds one hour, and replacement of lost electrolytes (especially sodium and potassium, which are major components of perspiration) can also be helpful. Excessive fatigue, especially in warm weather, should be avoided. Vitamin A is a group of compounds that play an important role in vision, bone growth, reproduction, cell division, and cell differentiation (in which a cell becomes part of the brain, muscle, lungs, blood, or other specialized tissue.) Vitamin A helps regulate the immune system, which helps prevent or fight off infections by making white blood cells that destroy harmful bacteria and viruses. Vitamin A also may help lymphocytes (a type of white blood cell) fight infections more effectively. Vitamin A promotes healthy surface linings of the eyes and the respiratory, urinary, and intestinal tracts. When those linings break down, it becomes easier for bacteria to enter the body and cause infection. Vitamin A also helps the skin and mucous membranes function as a barrier to bacteria and viruses. In general, there are two categories of vitamin A, depending on whether the food source is an animal or a plant. Vitamin A found in foods that come from animals is called preformed vitamin A. It is absorbed in the form of retinol, one of the most usable (active) forms of vitamin A. Sources include liver, whole milk, and some fortified food products. Retinol can be made into retinal and retinoic acid (other active forms of vitamin A) in the body. Vitamin A that is found in colorful fruits and vegetables is called provitamin A carotenoid. They can be made into retinol in the body. In the United States, approximately 26% of vitamin A consumed by men and 34% of vitamin A consumed by women is in the form of provitamin A carotenoids. Common provitamin A carotenoids found in foods that come from plants are beta-carotene, alpha-carotene, and beta-cryptoxanthin. Among these, beta-carotene is most efficiently made into retinol. Alpha-carotene and beta-cryptoxanthin are also converted to vitamin A, but only half as efficiently as beta-carotene. Of the 563 identified carotenoids, fewer than 10% can be made into vitamin A in the body. Lycopene, lutein, and zeaxanthin are carotenoids that do not have vitamin A activity but have other health promoting properties. The Institute of Medicine (IOM) encourages consumption of all carotenoid-rich fruits and vegetables for their health-promoting benefits. Some provitamin A carotenoids have been shown to function as antioxidants in laboratory studies; however, this role has not been consistently demonstrated in humans. Antioxidants protect cells from free radicals, which are potentially damaging by-products of oxygen metabolism that may contribute to the development of some chronic diseases. What foods provide vitamin A ? Retinol is found in foods that come from animals such as whole eggs, milk, and liver. Most fat-free milk and dried nonfat milk solids sold in the United States are fortified with vitamin A to replace the amount lost when the fat is removed. Fortified foods such as fortified breakfast cereals also provide vitamin A. Provitamin A carotenoids are abundant in darkly colored fruits and vegetables. The 2000 National Health and Nutrition Examination Survey (NHANES) indicated that major dietary contributors of retinol are milk, margarine, eggs, beef liver and fortified breakfast cereals, whereas major contributors of provitamin A carotenoids are carrots, cantaloupes, sweet potatoes, and spinach. Vitamin A in foods that come from animals is well absorbed and used efficiently by the body. Vitamin A in foods that come from plants is not as well absorbed as animal sources of vitamin A. Tables 1 and 2 suggest many sources of vitamin A and provitamin A carotenoids. What are the health risks of too much vitamin A ? Hypervitaminosis A refers to high storage levels of vitamin A in the body that can lead to toxic symptoms. There are four major adverse effects of hypervitaminosis A: birth defects, liver abnormalities, reduced bone mineral density that may result in osteoporosis (see the previous section), and central nervous system disorders. Toxic symptoms can also arise after consuming very large amounts of preformed vitamin A over a short period of time. Signs of acute toxicity include nausea and vomiting, headache, dizziness, blurred vision, and muscular uncoordination. Although hypervitaminosis A can occur when large amounts of liver are regularly consumed, most cases result from taking excess amounts of the nutrient in supplements. What are the health risks of too many Carotenoids ? Provitamin A carotenoids such as beta-carotene are generally considered safe because they are not associated with specific adverse health effects. Their conversion to vitamin A decreases when body stores are full. A high intake of provitamin A carotenoids can turn the skin yellow, but this is not considered dangerous to health.